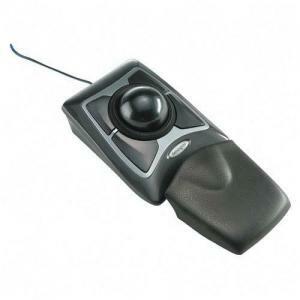 The best trackball ever made has just gotten better. Designed for PCs and Mac's, the new Expert Mouse employs Kensington's Diamond Eye optical technology for smooth, precise cursor movement. Surrounding the ball, we have a brand new implementation of our award winning Scroll Ring that puts scrolling right at your fingertips. More comfortable than ever, the Expert Mouse even comes with a soft new wrist rest-right in the box! You get all of these great new features along with the same, large ball, exceptional control, and ease-of-use that has set the industry standard for more than 15 years. DiamondEye Optical tracking for superior accuracy. Award-winning Scroll Ring - precise scrolling at your fingertips. Exceptional comfort for ultimate productivity. Large ball for maximum precision and control. Detachable wrist rest cradles your hand in comfort. Pointing Device Cable Length: 72"